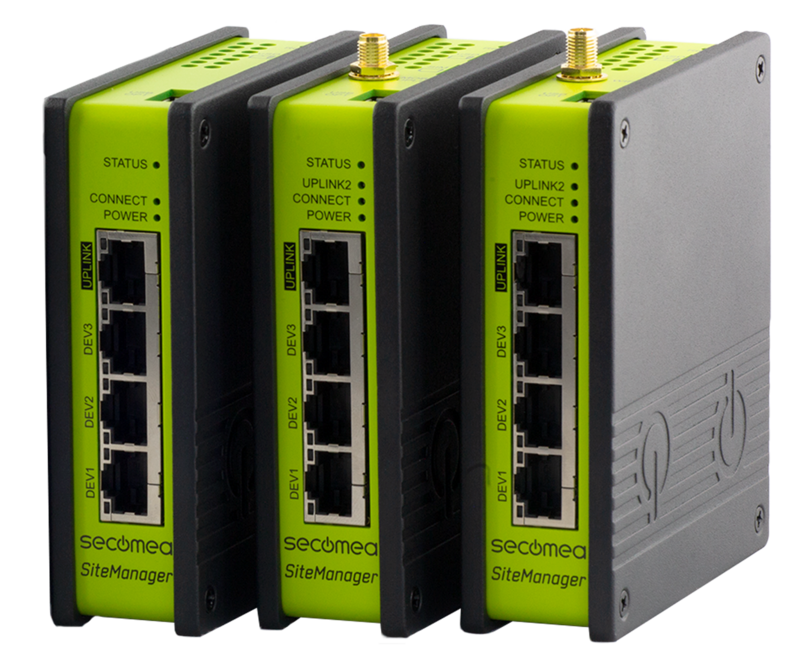 The new SiteManager 35xx series from Secomea with its distinctive green interface panel, offers secure remote access and data collection all in one unit. It also introduces some useful new features, making this a versatile package, ideal for machine builders and integrators. The SiteManager 35xx series is a DIN mountable industrial gateway that is installed in machine control panels to provide remote access for real-time servicing of industrial equipment. The data collection capability allows service engineers to analyse cloud data for predictive and preventative maintenance of the connected equipment. It is extremely easy to set-up, with a built-in assistant and is firewall friendly too. The device can connect to the internet via LAN, WiFi or a mobile network. For the first time it comes with three individually managed device ports, with separate DHCP servers. For most applications this will avoid the need for an additional network switch. Up to 100 devices can be connected simultaneously via Ethernet, serial or USB, previously limited to 25 devices. The SiteManager 35xx series features integrated flash memory for a store-and-forward database, ensuring data integrity in the event of losing internet access or power. With the addition of a micro SD slot, this can be further extended if required. The unit includes an integrated data collection module, which allows data to be collected from industrial machines via Modbus and OPC UA and then sent to cloud services such as AWS, Azure and Cumulocity. Secomea is a leading, secure remote access industrial communications solution for the automation and machine industry. For machine builders and system integrators it is a means of access to a whole host of remote devices including PLCs, HMIs, drives, I/O blocks, USB and serial devices. Secomea has been developed in Denmark by Secomea A/S, one of the leading providers of remote access solutions for the automation and machine industry. It is available in the UK from X-STK, the control and automation product sales division of Applied Automation (UK) Ltd. A starter pack is available from £365. More information about Secomea, including a detailed pdf information sheet is available at www.appliedautomation.co.uk/X-STK/Secomea.